Hello fellow Disney Chums, I just got back from my last trip to the Disneyland, when I say last, I mean last ( for a long while) .Yes, I am not renewing my preferred pass to the park for at least a couple of years. I know I might go through some withdrawals along the way, but this time I think I can handle it. I know I have written about my feeling on this before, but I am kind of getting burned out on the crowds and myself doing the same old things that I have done a million times. This does not mean I don't love the park or the Disney Legacy, I just know I need a change when I am talking to myself saying "what am I doing here" I have just rode Peter Pan for the 1500th time! I know in about 3 months they will find me on the floor with foam coming out of my mouth for not being able to visit the park, but I am trying to put a good face on it and get ready for the change. I am going to try to wait until the new rides (Cars) and other improvements are finished and running in DCA. I attended the park on the last day my pass expired (July 29th 2010). I thought I would go out with a bang and end the day with a viewing of the new, toted, "Wonderful World of Color". I apprehensively booked a dinner reservation at the Winery, I had eaten there two years ago and was not impressed. However, the only way to get a preferred (standing room) ticket for the show was to eat there or Ariel's Grotto. Since my little princess outfit no longer fit's my 240 pound man frame, I chose (you guessed it) the Winery. While making my dinner reservation over the phone to "Disney Dining" I asked them if I could eat at "Steakhouse 55" and receive the same preferred ticket for the show. They replied with a resounding (No). I then pleaded saying I spent way more money at the steakhouse and that they should extend the benefit to someone like me, since I spend at least $80.00 to $100.00 on a dinner there. I soon realized it was either Ariel's Grotto or the Winery, I chose the latter. They told me it would be around $39.00 for the dinner at the Winery and it included salad, bread, and a main entree and dessert. I thought, well it's my last visit for awhile and the preferred viewing space was worth it even if the food was horrible. I got to the restaurant, got a table very fast and was immediately served. My waitress brought me out some fresh bread, and hot coffee (it was cold that night). I dipped the bread in the Balsamic Vinegar and Oil it was quite good. I then had a choice between the Fish or Beef Wellington as the main course. I chose the beef, and it arrived in a generous portion, with little potatoes on the side and I think asparagus. I have to say friends that the food was really great in my opinion, much better than the old days of this restaurant. Even my trusty server said when she was asked to come over to work here (from another Disney food location) she thought "Oh No" this is not going to be good thing. She was happily surprised that people actually liked the food. My dining experience was followed by 3 little desserts all on the same plate. They were different and yummy. Once I paid I received my ticket to the VIP area of the line, and I waited for the next show of "World of Color". The gal behind me sounded like she was coughing up a lung, so I covered my face and tried not to talk to her. Why don't people stay home when they are sick! The line moved after awhile and we were allowed into the main front viewing area of the show. There is nowhere to sit, unless on the ground. I think Walt would have put in some simple benches, he kind of rolled like that. I stood at the top of the stairs in the direct middle, people roaming the area soon realized I had a great vantage point so they crowded around me like I was giving out money. Soon I could not move my arms people were so close to me. I looked around them and realized no one was crowded at any spot except for mine. I was ready to move my vantage point when the little voice in my head said "no, don't move you were here first" you know how you say stuff like that on busy days in the park when people invade your space. So I stayed, as long as the girl with the whooping cough held her distance I was cool. I noticed quite a few people were going under the ropes from the cheap seats to our side whenever the attendant was not looking. At first I was annoyed, hey man I paid $39.00 for dinner and this spot! I soon didn't care, I just wanted the show to start, end, and to sit down! All the standing in line, and standing in my coveted viewing perspective was killing me. Finally the show started! Yahoo! The very front crowd (right by the water) soon realized they were going to get soaking wet, so they all ran back towards me and my new found squeezers. Now I really was packed in like a Burrito. Sorry to say, the only thought that made me happy was that I was not renewing my pass. Lights, Water, Action! Here it was, the show everyone was waiting for, happening right in front of me, Weeee! Well after a short quick look I realized I was watching Fantasmic with more water, more color and no dragon. 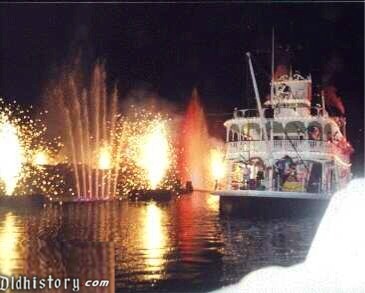 It was cool don't get me wrong, but come on, they used the same video behind water thing too much and even some of the same footage used in Fantasmic! Oh wow, here comes the fire, wow this reminds of, well you know, Fantasmic! I know there are probably a lot of you disagreeing with me, my film students really disagree, but that was my feeling about it. You know back in the old school days, I used to take dates to the Disney Hotel for the "Dancing Waters Show". It was free and really amazing, dancing water, lights and a very cool historical moving sound track, not just Disney film/animation music. This was better to me, smaller but very moving. I remember seeing guests cry at the end, including me at the hip age of 17. Not only that, after the show, you could take your date to the water caves and make-out down there. Maybe that's why I liked it so much more! For all its worth (in my opinion) this World of Color show should have been more catered to the actual World of Color TV show that we all waited for every Sunday night when I was a kid. The show, moving from ABC to NBC in 1961 because NBC had color and ABC did not, had some amazing TV programming, such as Daniel Boone, Johnny Tremain, Disney after Dark, Ludwig Von Drake, and other great animation (not) used in Fantasmic. Live action films from the vault of Disney could have been utilized. How about 20 Thousand Leagues under the Sea, Love Bug, Black beards Ghost, Bed Knobs & Broomsticks, Flubber! Ok, I'm done, now stepping off my soapbox. I will say this about the new show, it has drawn lots of new visitors to Disney California Adventure, and it has made a creative use of the old walkway lane, and turned the pond into a viable attraction. So believe it or not, I do get it. I have never seen so many people there as in my last night of my pass. The new dancers under big sun at the entrance was cool, I heard from a friend that they were not hired by Disney Talent, but an outside talent agency and that it was creating tension in the ranks. Oh well, that's about it for now, I will be back to the park when new changes and add-ons have been implemented. I know I will have some cool stuff to look forward to. Until then I will have tons of other Disney topics to write about, I hope you enjoy them.